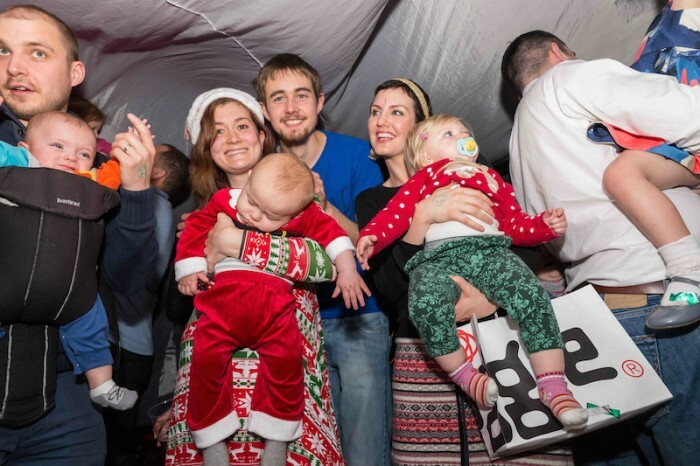 World famous, award winning, Glastonbury Festival performing, family rave sensation BFLF throws the ultimate festive family event in a new venue – a fairy light bedouin tent outside on Parsons Green! BFLF resident DJ Joe Muggs plays to packed dance floors as he spins a festive mix of old skool, house, hip hop, techno, electro, UK garage, drum’n’bass and anything else that takes his fancy. The multi-sensory dancefloor with glitter cannons, bubbles, giant balloons and parachute dance will also have a snow machine helping to make everyone full of good cheer. Get crafty on the Captain Cookie craft tables with giant mural, themed crafts and playdoh table. Licensed bar, free transfer tattoos and glowsticks. The event space has a whole host of lovely food stalls. Please be aware that whilst the dance floor will be under cover of a bedouin tent (!) the event is outside and so dress appropriately for the weather. Buggies will need rain covers as the buggy park will be outside. Tickets to the BFLF event include entry to the Winter on the Green event space. For families with younger children (8s and under) though all ages are welcome. Adults are not admitted unless accompanied by a child in their group. A max of 3 children per adult. Please be aware that events are standing/dancing with limited seating, club lighting rigs (no strobes) are used and events are busy with around 500 people at each party – which helps create the rave ambience. Each event is stewarded and risk assessed in advance. Buggies must be left in buggy park (and at this venue this will be outside – please bring a cover if it looks like rain) and will not be allowed on the dance floor. DJs are subject to last minute change.